Between the Heritage Auction and the Stack’s Bowers Sale in Philadelphia, there were over 100 coins that brought $100,000 or more, while at least 110 coins sold for between $50,000 and $100,000. The two auctions realized a combined total of over $68 million. Much of the action was enhanced by bids from international buyers. Granted, not all of these coins traded at current FMV prices, some were over and some brought less than expected. 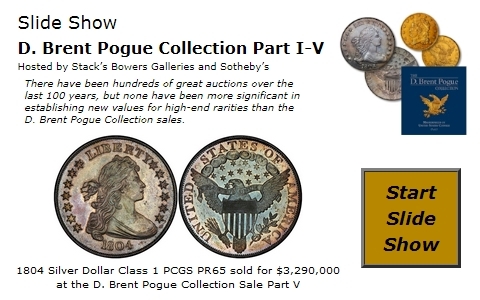 However, the depth and breadth of these two historic sales shows the strength of the coin market not only in the United States, but all over the world. The rare coin market is dynamic; even international buyers want nice rarities and they are willing to spend the money to acquire them. The highlights were many for both auction houses but the most memorable for Heritage had to be the 1907 $20 Saint Gaudens Ultra High Relief, Sans Serif Edge that sold for $1,057,500; this was certified as PR58 by PCGS. Another true rarity was the 1802 Bust Dollar that was certified by PCGS as PR65 Cameo and it had a CAC sticker as well. This coin realized $851,875 and is certain to be a center piece for a new collection. In the Stack’s Bowers Sale the hands down class of the auction was the 1873 CC Seated Dime No Arrows in PCGS MS65; this unique rarity brought $1,840,000. The Battle Born Collection contained a total of 111 coins, twenty one of which sold for over $100,000. This was one of the most anticipated collections ever made available. Many of the coins offered had no previous legitimate pricing information. The following is a list of Carson City coins that now have a new FMV for the specific grade. For all of the coins above and many of the others sold in the Battle Born Collection, buying opportunities do not come along very often. The following graph illustrates the infrequency of availability for many of these issues, more specifically the 1873 CC $5 Gold in MS62. 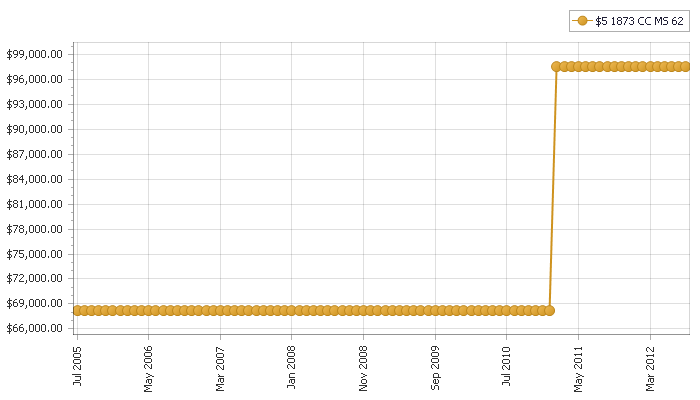 The graph shows the FMV of $68,250 at the beginning of July 2005. The most current FMV was $97,500. With the latest sale FMV has increased to $106,880. The graph shows only two price changes over this seven year period. The fact that there are only a total of two coins certified by NGC and PCGS with none higher is a good indication why there is very infrequent trading information.